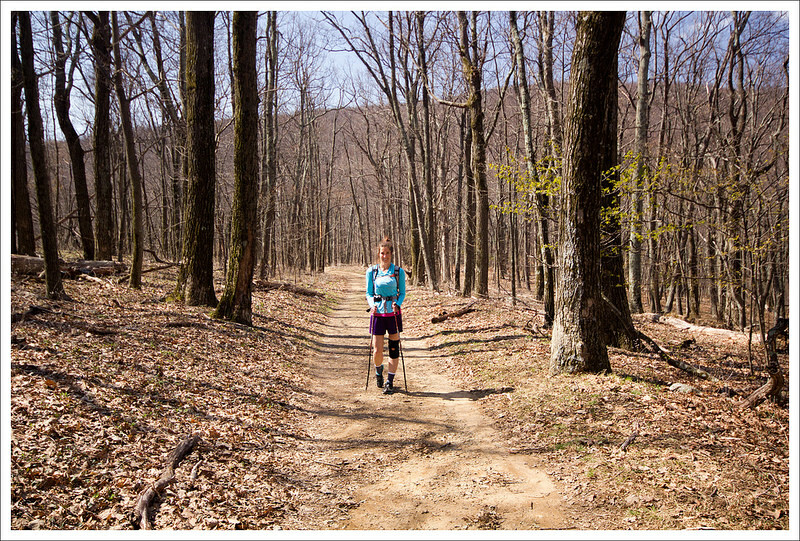 This 8-mile hike completes our Appalachian Trail mileage in Shenandoah National Park. There isn’t much to see along this section of trail – the views aren’t great and the stream is fairly run-of-the-mill, but we’re still happy to say we’ve walked every step of the AT in Shenandoah! Adam coming off the trail on Route 522 in Front Royal. 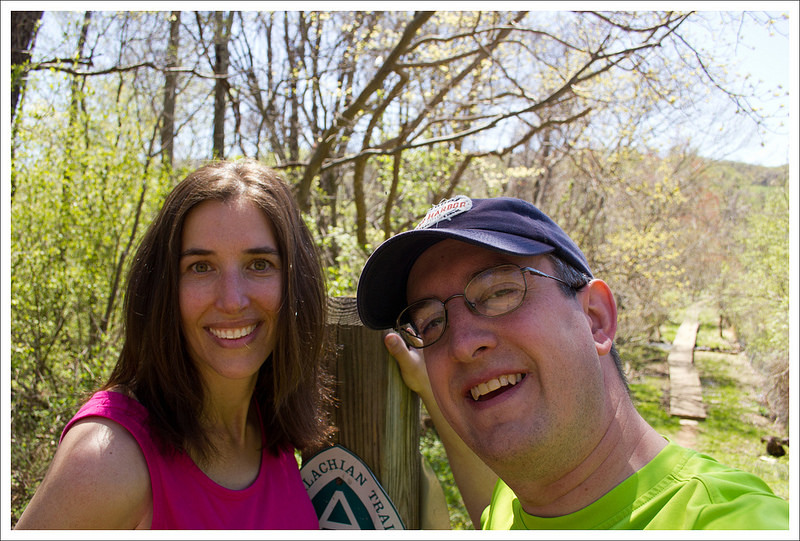 We finally finished hiking the Appalachian Trail through Shenandoah! For two years, less than 5 trail miles were keeping us from that distinction. It’s really quite silly, but this final stretch of trail has been somewhat of a mental burden for me! The reason was sort of two-fold. The first sticking point – in order to most efficiently cover the miles, we needed to do a car shuttle. I didn’t want to spend the gas money, and honestly, I just don’t like to drive by myself. Shuttles are just a pain when both cars are yours! The second problem was that this stretch of trail just seemed… boring. I will admit that a bad day hiking is still better than a good day doing many other things, but I had a hard time getting myself psyched-up to hike this stretch. Finally, faced with a beautiful spring day and a lack of plans, I acquiesced. We dropped our first car off in a small AT parking lot on the side of 522. Then we headed into the park and left a second car at Jenkins Gap –where we came off the trail after our last section of the AT in SNP. From Jenkins Gap, we had a steady uphill to the summit of Compton Peak. At the summit of Compton, there are blue-blazed trails leading to viewpoints on both the east and west sides of the mountain. Each viewpoint lies .2 miles off the AT. We decided to only visit the west summit (it has better views.) The east summit has some interesting columnar rock formations. If you’re into geology, they’re definitely worth a peek! 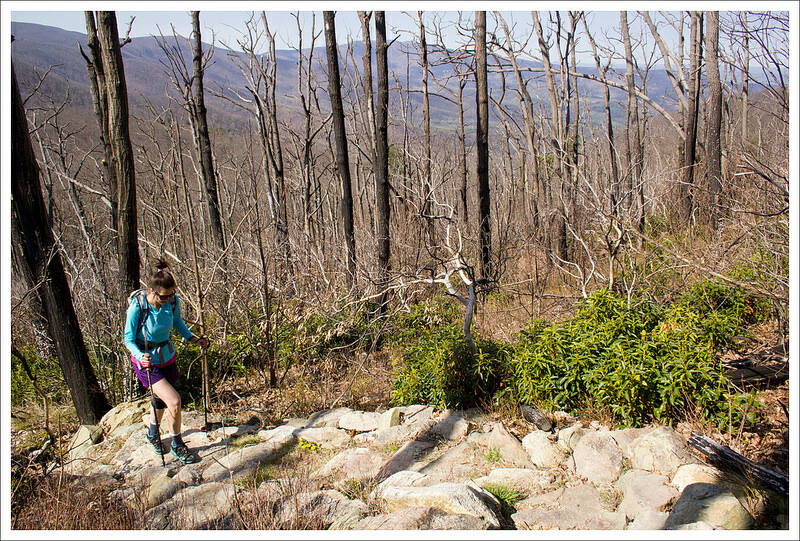 The summit of Compton Peak offers two viewpoints – each about .2 miles off the AT. We went to to just the western view. 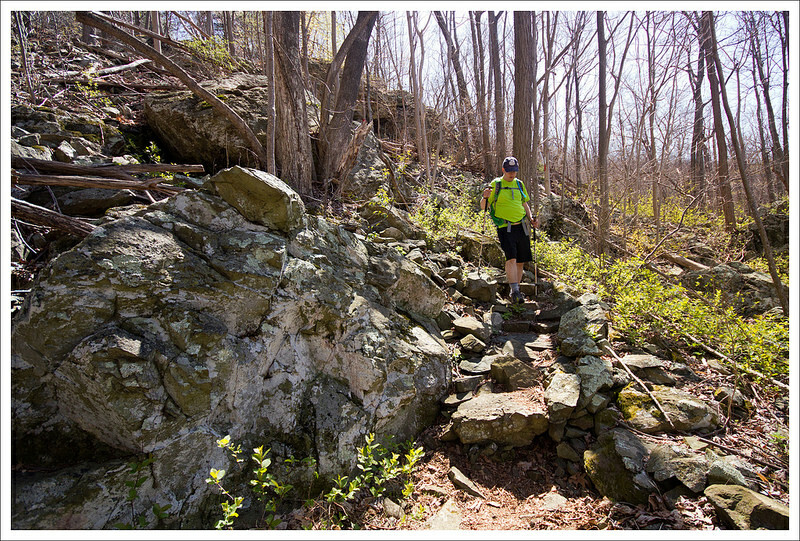 Below: Ascending Compton Peak on the Appalachian Trail; Adam passes one of several large boulders on the trail; After Compton Gap, the trail is blazed both white (AT) and yellow (horse trail) for a while as it follows a fire road. After the summit, we descended for almost a mile into Compton Gap. 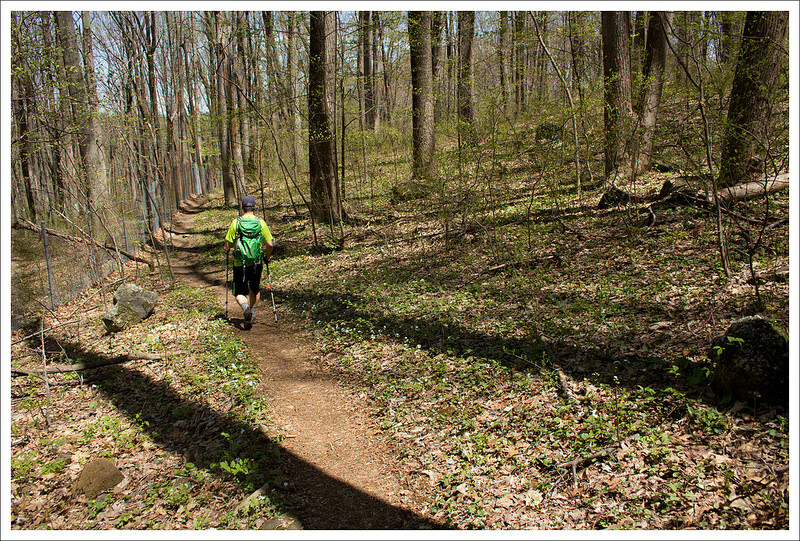 After Compton Gap, the AT is shared with the yellow-blazed Compton Gap trail for about 1.7 miles. The hiking is along this section is wooded trail without many distinguishing features – no streams or overlooks to speak of. The trail is wide, flat and very easy to walk. You’ll likely pick up a lot of speed along this stretch! 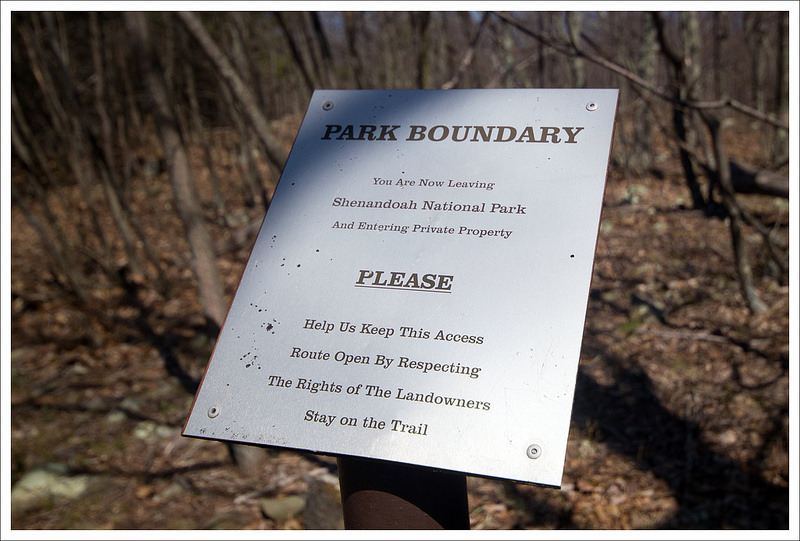 At roughly 4.9 miles into the hike, we reached the park boundary. There is a sign marking the beginning of private land. Just south of the park boundary, there is also a backcountry permit station. Permits are free and self-service in Shenandoah. If you’re going to camp in Shenandoah’s backcountry, all you need to do is fill out a tag and tether a copy to your pack. It’s really easy! Right after we departed the park, we came to the one viewpoint from this stretch of Appalachian Trail. Possums Rest has a decent, but slightly obstructed view, of rolling foothills. It’s worth a stop, but there are definitely many better views along the AT in Shenandoah. From Possums Rest, the trail descended briefly but steeply through a jumble of rocks. 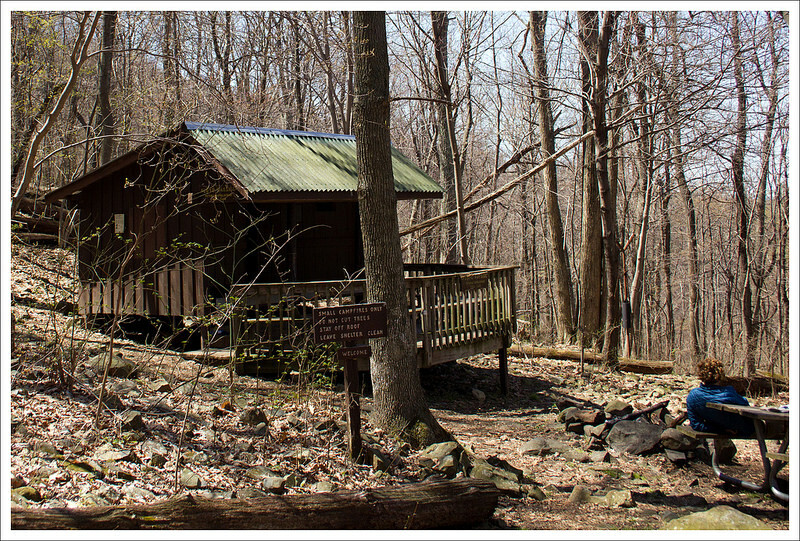 In about another .7 miles, we reached the Tom Floyd Wayside – the first backcountry shelter located north of the park. It’s a nice spot with a nearby water source. We chatted with a section hiker from Washington, DC. He had completed a thru-hike the year before, but evidently the trail called him back! There is one obstructed viewpoint, called Possums Rest, shortly after passing out of the park boundary. Below: Just inside the boundary, there is a backcountry permit registration station; Park boundary; Descending a short, rocky section after Possums Rest. After Tom Floyd, the trail continued very gradually downhill. As we walked along, we could see the advance of spring on the lower elevations. 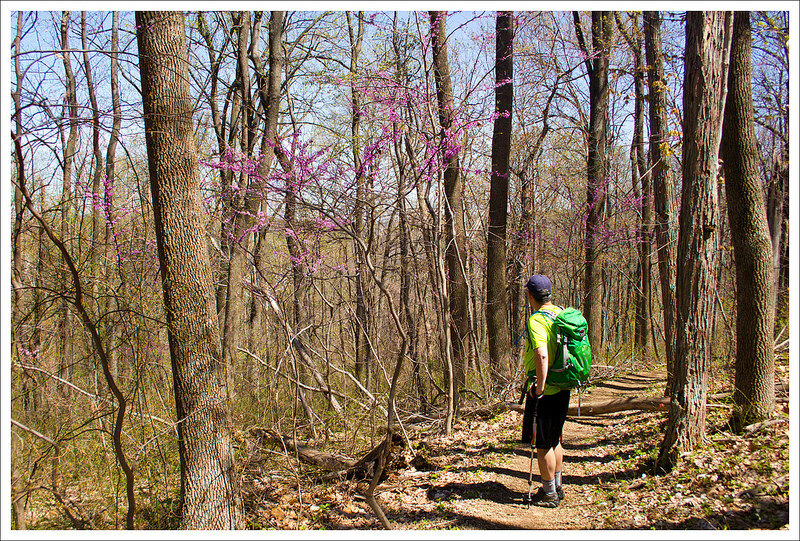 Redbuds were blooming, tiny green leaves were opening in the canopy and the grass along the trail was growing quickly. We crossed Rt. 601, and a little over a mile later, Moore Run and then Rt. 602. The stream was crossing was just an easy rock-hop. After crossing 602, we had a short uphill before one final descent to Rt. 522 in Front Royal. The last part of the hike followed a chain link fence for over a mile. I’m not sure if the fence was just marking private land, or if it was part of the Smithsonian Conservation Biology Institute. Either way, it is one of the less scenic parts of the AT. 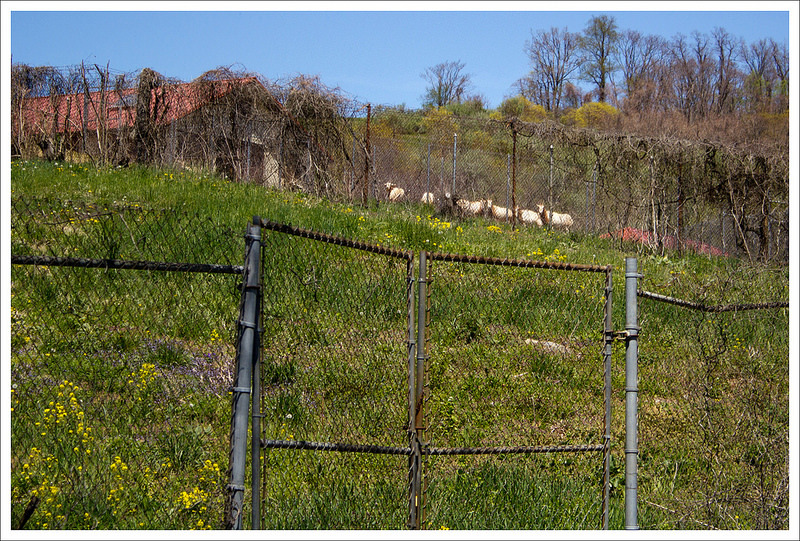 The last quarter mile of the hike passed between fenced pasture land and a residential neighborhood. After crossing a small wooden footbridge, we found ourselves back at the car. On our way out, we saw a few of the Smithsonian’s animals walking down a hillside. They appeared to be some type of antelope – kind of neat! Before going back to pick up our second car, we stopped at Spelunker’s in Front Royal for lunch. 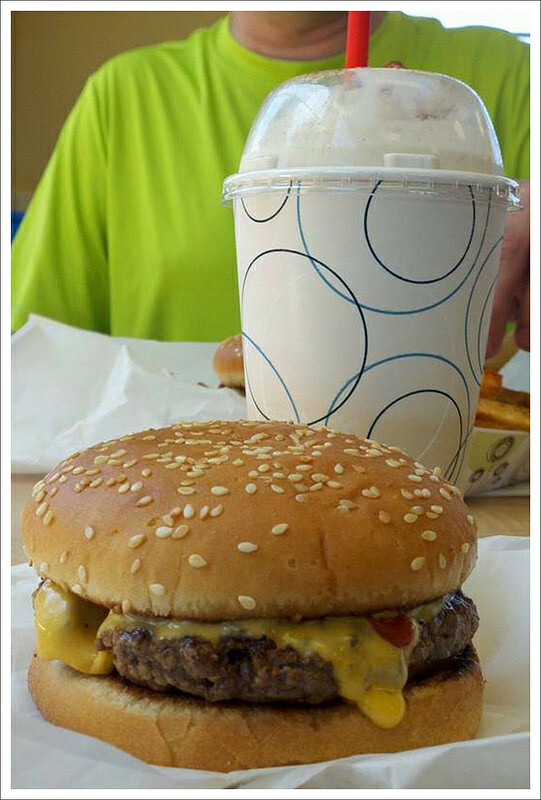 They make fantastic burgers and milkshakes! I was thrilled to see gingersnap was their shake flavor of the day! While this hike didn’t provide much reward with views or waterfalls, I’m still really glad we did it. I’m happy to be officially and technically finished with Shenandoah’s AT miles! It was great to finally finish the AT section through Shenandoah National Park! With the entire trail being 2180 miles from Georgia to Maine, the section through Shenandoah National Park is less than 5% of the entire trail. Daunting to say the least, but we still feel we have accomplished something measurable. 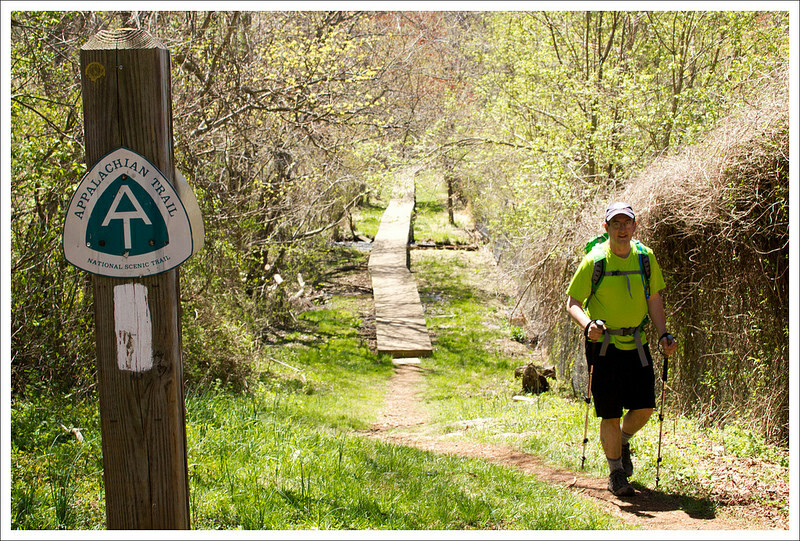 There are about 550 miles of the AT through Virginia, making it the longest section through any one state. Virginia is also a state where a lot of thru-hikers quit, feeling that they will never get through the state (often called the “Virginia Blues”). The section through Shenandoah is more like 19% of the AT through Virginia. 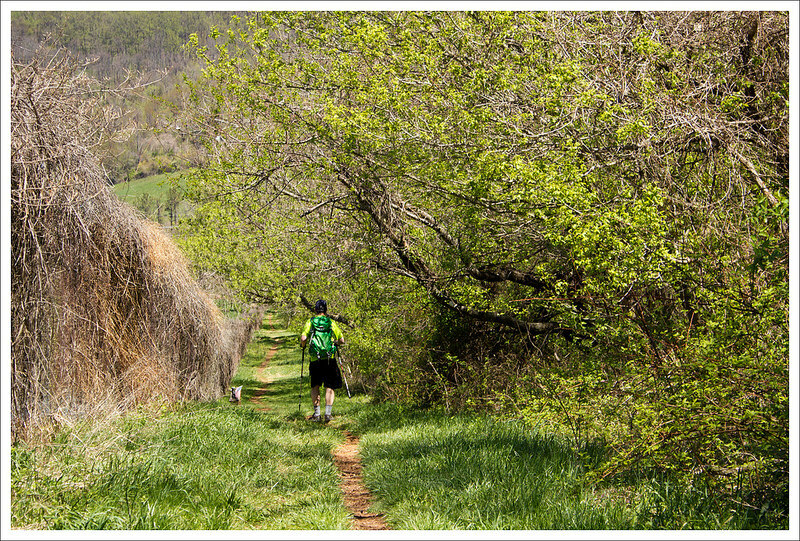 Most of the thru-hikers fly through Shenandoah National Park, averaging over 20 miles per day. The climbs are not as tough as in many sections and they have worked into their “trail legs”, gaining the strength to cover many miles per day. Tom Floyd Wayside is outside the park boundary and is the last shelter before reaching Front Royal. Below: Redbuds blooming at the lower elevations; Christine crossing Moore Run; The last mile or so of the trail followed a long, chain link fence. After we dropped our car off at the trail crossing of Route 522, we made our way into the park and parked at Jenkins Gap. While you will drive about 12.4 miles on Skyline Drive, the trail through the park and out is a lot shorter. From the parking lot, you join the Jenkins Gap Trail for just about 100 feet and then take a right to join the white-blazed Appalachian Trail, heading north. The trail took us through some storm-damaged areas of trees, leading us through one of the two ascents on this trail. We gained about 500 feet up to Compton Peak. 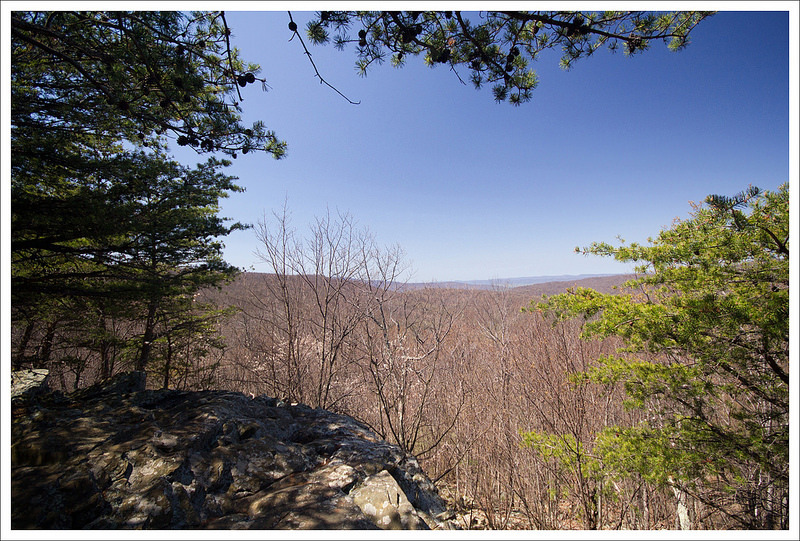 At 1.4 miles, we reached a post which pointed out to two short blue-blazed trails that lead to views from Compton Peak. Since we knew there wasn’t going to be many views on this trail, we decided to take a left and check out the West Compton Peak view. This side trail of .2 miles was a rocky uphill trail that led to a small, but scenic viewpoint. We made our way back the way we came to reach the post and then took a left to continue on the Appalachian Trail heading north. The trail descended again, as we dropped 500 feet in about .8 miles. If you did the side trail to Compton Peak, add another .3 miles to any of the distances given from this point forward. 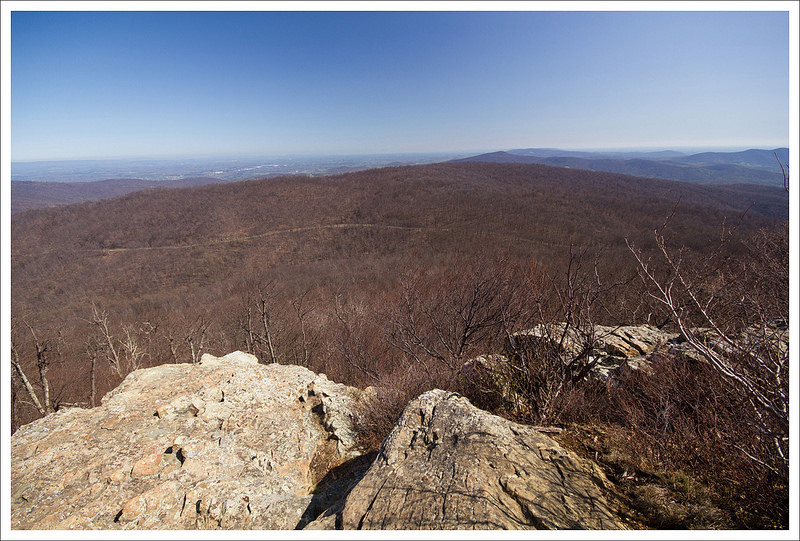 At 2.2 miles on the AT, you cross over Skyline Drive at Compton Gap. At 2.4 miles, you reach a junction with the Dickey Ridge Trail and at 2.7 miles, you reach a junction with the Springhouse Trail. The Springhouse Trail allows for horses and actually shares the next section of the AT, which is why you will see both yellow and white blazes. The trail is fairly level at this point. At 3.8 miles, you reach a junction with the Compton Gap Trail. This is where horse-riders would come off the AT, since they are not allowed further on the trail. Take a left here to stay on the white-blazed AT. 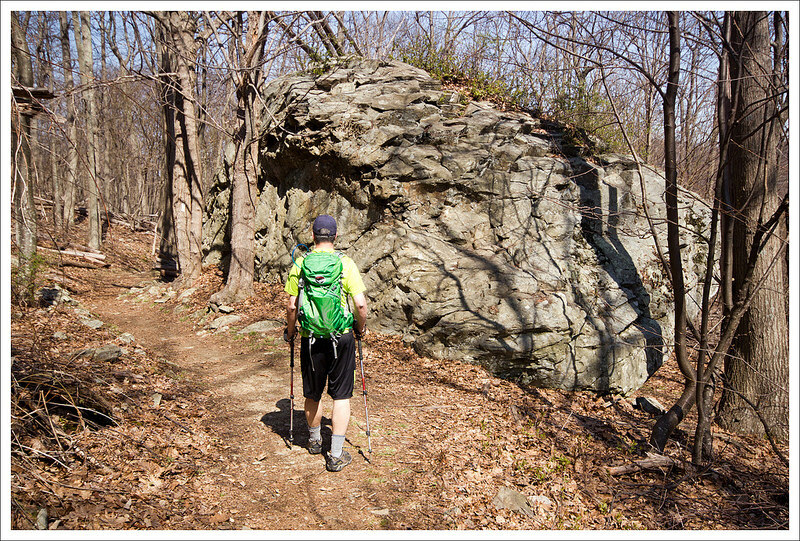 You will soon come across an area where backpackers can fill out paperwork for backcountry camping permits and continuing further, you will reach the Shenandoah National Park boundary at 4.0 miles. Within a short distance, you reach the area known as Possums Rest, a very small overlook that has some views. The trail at this point goes down a very steep and rocky area as you go below Possums Rest. The trail descends for most of the rest of the way At 4.7 miles, you reach the Tom Floyd Wayside shelter, which also has tent sites, a privy, and a nearby spring. Continuing from the Tom Floyd Wayside, you descend further, passing by other signs for the spring. At 5.1 miles, you reach a junction with a side trail to VA-601. 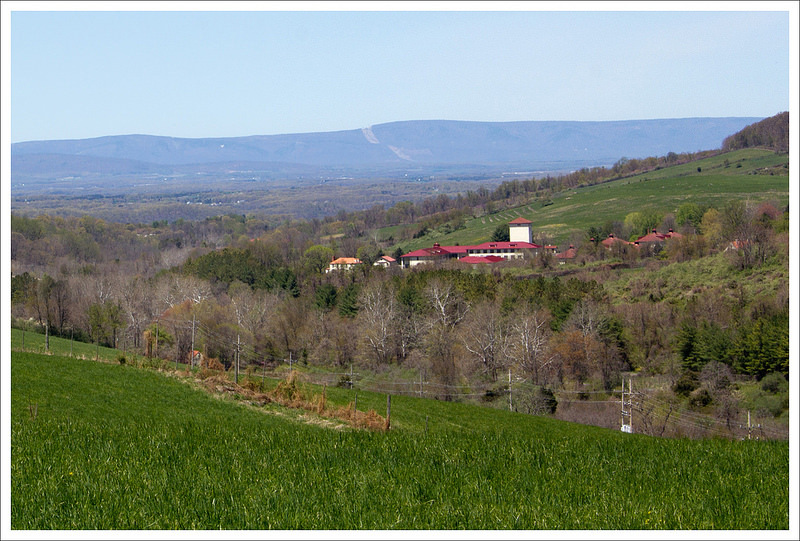 From here, you have a couple of stream crossings over Moore Run and at 6.5 miles, the trail crosses VA-602. The trail at this point goes up a steep upgrade, as you gain over 300 feet in .4 miles. Once you reach the crest of the hill at 6.9 miles, the trail descends again as you go through a grassy area. You walk along a long fenceline and behind some people’s houses before reaching the boardwalk which takes you back to your car at 7.7 miles. Decadent lunch at Spelunker’s in Front Royal – cheeseburger and a gingersnap milkshake! Below: The Smithsonian National Zoo has a conservation facility in Front Royal; If you’re lucky, you might catch a glimpse of the animal – we saw some kind of antelopes; A sweaty selfie at the finish line. Once we made our way back to the car, we stopped at Spelunkers. There was a large bike ride being conducted nearby, so the place was quite crowded. One of the great things about hiking for us is that it allows us to eat whatever we want after a hike and not worry about the calories. We made our way from there back to our first car and then headed out of the park. It was a gorgeous day for a hike with perfect temperatures. While this hike isn’t the most scenic, this was definitely one I will remember since it was our “finish line” though SNP. I’m so grateful to have a wonderful hiking partner to share all of these experiences. Elevation Change – About 1900 ft. but mostly downhill. Difficulty – 2.5. There are really only two climbs on this hike – one up Compton Peak and one shorter one near the end of the hike. All in all, it’s a moderate, mostly downhill hike. Trail Conditions – 4. Nicely maintained section of the Appalachian Trail. In fact, we saw a crew member trimming grass back when we hiked. Views – 2. The view from Compton Peak is decent, but it’s not actually on the trail. Possums rest is small and a bit obstructed. Streams/Waterfalls – 2. Moore Run was flowing nicely when we visited. Wildlife – 2. You may get to catch a glimpse of zoo animals at the Smithsonian facility at the end of this hike! Ease to Navigate – 3. There are lots of trail junctions and shared paths. Just make sure you follow the white blazes and you’ll be fine. Solitude – 2. We saw many dayhikers and backpackers on this stretch of trail. Directions to trailhead: We parked one car at the parking lot on US-522 in Front Royal, which is 4.7 miles from where US-340 intersects with US-522. We then drove to northwest on US-522 for 2.8 miles. Take a left on E. Criser Road. In .7 miles, take a left on US-340. 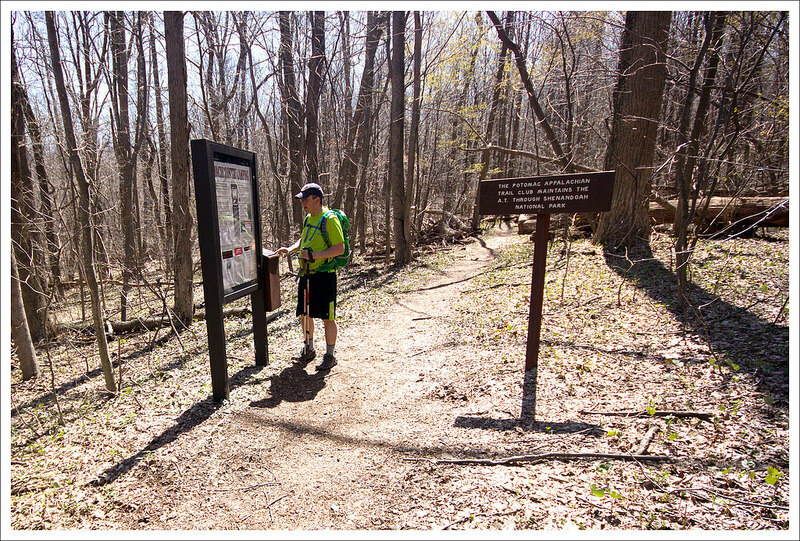 In .2 miles, take a left to enter Shenandoah National Park. Drive 12.3 miles to park at the Jenkins Gap parking lot on the right. Join the Jenkins Gap Trail from the parking lot for a short distance, before taking a right on to the Appalachian Trail, heading north. Have you been down the east summit trail on Compton before to see the columnar basalt? For me it is one of the most interesting spots in the park. We’ve been out on the east summit twice, but I guess I’ve never noticed the columnar basalt. We skipped the east summit completely on this hike. It’s easy to miss it if you aren’t looking for it- you have to hike to the bottom of the big rock at the east summit to see it. It’s fairly similar to formations like the Giant’s Causeway in northern Ireland. We’ll look for it next time we’re in the area!